2014 is the year we finally hacked into one of the older 16bit GSXR-750 ECUs!!! After more than 10 years, we've finally managed to successfully dump the contents of a K3 750 ECU (32920-35FD0). But, the news is bittersweet... This particular model uses a mask-rom CPU that cannot be flashed, but that doesn't necessarily apply to all the 16bit GSXR-750 ECUs out there. With at least 12 different models in the 32920-35Fxx series (that I'm aware of), there's bound to be one that's flashable. So the search is on!!! Kudos to Psyche for the software coding, Rhinoman for the parallel port interface design and Luke111 for helping identify the CPU. I started this new thread because I wanted to limit the discussion specifically to the 16bit GSXR-750 ECUs. There's just too much confusion otherwise. Well we're run into some delays getting the 32920-35F40 ECU dumped due to problems with the parallel port BDM interface. Think we're past that now with the development of a new CPU16 Serial Interface. Great news from Down Under!!! The K1 35F40 has been hacked, and it's flashable!!! I have the 35F40 bin file & I have created definitions for romraider to suit. Looking to share or swap for other 35Fxx & 40fxx bins. I would be more than happy to create definitions to suit. I couldn't have done it without the help from mr_hollywood. Using his usb-bdm adapter & software it took no time at all! It is possible in the future we may be able to flash the ecu through the main harness and notching the ecu won't be necessary. We quickly discovered that the first part of the map was missing. Suzuki (or denso) had set it to disable the data. This is the part of the map that runs the show. It took a few emails back & forth but we managed to change a setting in the ecu to enable the data and then I managed to dump the entire contents. I can also confirm that this ecu is flashable. I spent quite a few hours analyzing the data I got from the ECU with a hex editor. I found the maps quite easily once I figured out to use a colour code for the data - then the tables really stand out. Im using romraider to look at my maps but first I needed to create a definition file to show the tables correctly. I've asked Ridgeracer & psyche to help me with this project as well. Its quite interesting look at what suzuki has done here. For instance, the first place I looked was the ignition timing tables. We still haven't worked out for sure what tables are for what gear so what I have in the screen shots are just an educated guess. I can compare between the 6 ignition maps that the timing is retarded slightly compared to the 5/6 gear map. I notice though timing is practically identical above 50% throttle. so basically the TRE only really works at less than 50% throttle. I do use a TRE on my bike mainly so I can get repeatable results while tuning. I also noticed that the timing advance jumps up a lot at around 3000rpm. I have always had trouble tuning in this area & now I know why. Suzuki could have made the transition smoother. They use common ignition maps for cylinders 1&4 and 2&3. On average the middle cylinders run more advance. They use individual fuel maps for speed density & alpha n. No 2 cylinders are the same either. The table sizes are different between fuelling & ignition. The rpms I have entered so far in the tables are just a guess. We will know what they are exactly after the ecu data has been disassembled. Anyway, here's some screen shots attached"
The 32920-35F30 is next on the list. Is there any info about flashing thru main harness possibilities? 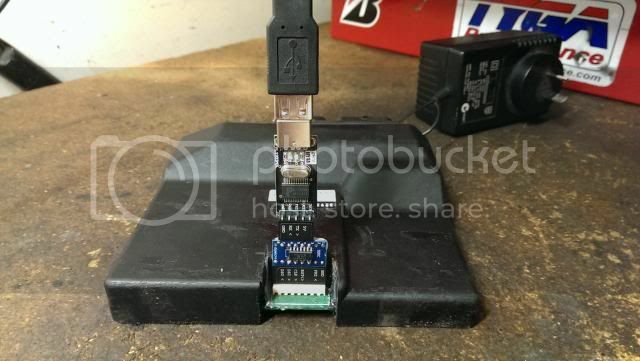 You will need to make an adaptor cable to connect the OBD, ECU and regulated 12v power supply together, but it's a lot easier than notching. It's been a long, long time coming, but we finally have an inexpensive flash tool for the K1-K3 GSX-R 600 and 750s. This program will allow you to read the 3 flash rom modules (into a 96k bin file), the BE flash and the MCU control registers. Many thanks to all those who have helped make this happen!!! The utility uploads directly to the ECU via ODB-II and displays the "Unsigned Left-Justified" contents of the eight 68HC916R3 ADC registers at $FF730-3F in real-time. is this your email : mr_hollywood@cogeco.ca ? That would be great... Thanks Carry!!! Currently working on the code for disabling the STVA & STP FI errors (thanks the amazing work done on the instrument cluster protocol by JoE over on TLZone). I expect to have the final version uploaded later this week. Successfully completed prototype testing yesterday on an in-harness OBD adaptor that would remain permanently connected to your ECU. This would allow for running bootloader utilities or the Flash Tool without having to remove the ECU. The design uses key switches to avoid accidental closing of the switches during normal operation and does not require cutting into the harness in any way. Not sure whether this will work on the GSX-R 600 because the STCU uses the same K-line pin as the VAG-COM OBD2 interface. Great work on this Mr H! A quick question if I may. Is the K-Line in use during normal operation? IE, can it be used for datalogging purposes? Background: I race a GSXR 750 SRAD EFI, and now coming up to the last batch of modifications which include engine tuning. I have de-potted the original SRAD ECU to find it to be none programmable and no separate socketable EPROM. At this point aftermarket ECM was the next logical thing, but nothing really fitted the bill for what I wanted. Either features, packaging or price wise. Now I had always considered an ECM swap, but the later gen stuff seemed a bit too much for my needs. The K1/2 fits perfectly. £20 gets an ECM, £30 gets another harness with the new connectors and I'm good to go! The reason I'm asking about data streams is so I can pipe it into my DIY data logger. If I can grab everything without notching, great. Otherwise I will hardwire in the BDM port direct to the logger to access the RAM variables. No, the K-Line is not used during normal operation (except on the 600s that use it to control the STCU). Getting the ECU to transmit OBD2 engine & sensor status is one of the things on my development roadmap, but I haven't had much time to work on it this past season. Ideally, I'd like to use an ELM327 to transmit to a datalogger via WiFi. You should bear in mind that not all the 2000-2003 ECUs are flashable and you can't tell which are, just by looking at them. You have to test the unit to find out. Also, the engine won't run during BDM, so that won't be much use to you for datalogging. Feel free to drop me an email at mr_hollywood@cogeco.ca if you want to discuss further.